Sales Renewal is a full service marketing agency whose reinvention of small business marketing began with the JointSourcing Solution™(“joint venture” + “insourcing”): a complete, one-stop marketing solution that shares the risk/reward. 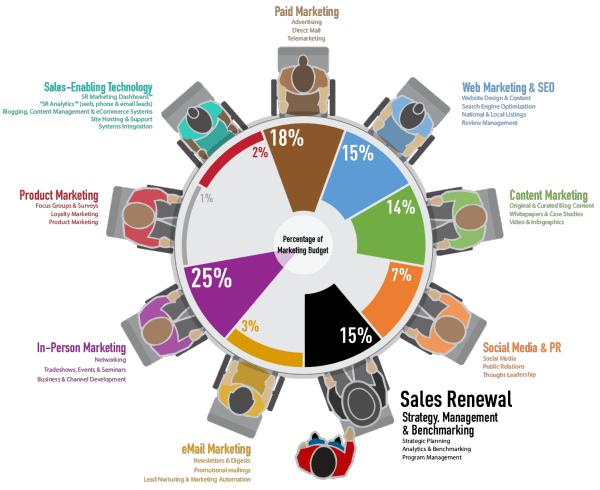 JointSourcing is a comprehensive, integrated marketing solution that delivers all the strategies, people and technology needed to grow your revenue. It not only includes a custom package of the most cost-effective marketing strategies and sales-enabling technology for your business, it also provides (“insources”) all the people and expertise necessary to implement and manage them (complementing those already in your employ). 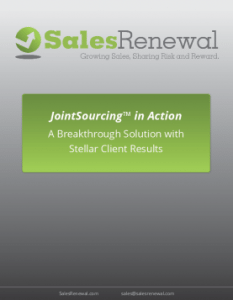 The JointSourcing Solution provides the best of both worlds: the comprehensive, integrated marketing solution that will grow sales combined with the depth of specific marketing expertise and experience in your industry, that will grow them dramatically. And it will do all this while freeing up your time; the time you will not spend on nitty-gritty marketing details. 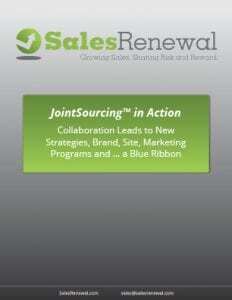 The JointSourcing Solution™, full service, one-stop solution is created, not by outsourcing marketing to third parties, but by insourcing all the people, expertise and technologies you need to create a dedicated, expert marketing team (which can include those already on staff). This insourced, cross-functional team handles all the day-to-day marketing tasks and has its own “VP of Marketing” who reports to you—which saves you signficant time without your having to give up significant control. Furthermore, you are not burdened with finding or hiring the team or paying their full time salaries or benefits. Importantly, the insourced team will have the specific mix of expertise that will best grow your business because, as a Marketing General Contractor, Sales Renewal can draw from all marketing disciplines (as seen in the illustration at the top of the page). To solve the problems that cause most small business marketing to fail, Sales Renewal has developed a powerful paradigm for small business marketing inspired by the construction industry: the General Contractor. Construction is a complicated, multidisciplinary endeavor that leverages firms with deep expertise in individual trades (plumbers, electricians, etc.) with General Contractors skilled in hiring, scheduling and managing the trades and their resources (building materials, permits, etc.). Importantly, the General Contractor is also soup-to-nuts responsible and is the only party the owner has to deal with. The combination of a General Contractor + skilled subcontractors delivers the breath of expertisecomplex jobs require without sacrificing the depth of expertise that leads to stellar results. And because the General Contractor is the single accountable party handling all day-to-day matters, the owner is free to attend to other responsibilities while their project is underway. Sounds like a good approach for Marketing, which is also a complicated, multidisciplinary endeavor, doesn’t it? We thought so too and that’s why we’ve been honing it since 2009 (unlike plumbers and electricians, PR firms, Ad Agencies and the other marketing “trades” are not used to working together and we’ve put considerable effort into the processes and technologies that corral them into an efficient team). JointSourcing’s proven 3-step process begins with a Blueprint, where we work with you to create a comprehensive, integrated plan for growth; the specific insourced team required to execute it; and the budget needed to support it. Here is an example of one such team and budget (for illustrative purposes only since, by definition, every JointSourcing team is custom).